If not, then keep on reading! Need a Cheap Retract Servo??? Need a Proportional Flap Servo??? Learn why a Two-Stroke is BETTER than a F-F-F-Four-Cycle! Learn the Secret Codes of the F-F-F-Four-Cycle Brand Names. Find out if your plane Deserves a F-F-F-Four-Cycle! Save money by Converting a 2 Stroke to a F-F-F-Four-Cycle! Read the Scientific Proof that a 2-Stroke's whining sound is exact scale! Learn why a Four-Stroke is BETTER than a T-Two-Stroke! Learn the Secret Codes of the T-Two-Stroke Brand Names. Find out if your plane Deserves a T-Two-Stroke! Save money by Converting a 2 Stroke to a T-Two-Stroke! Before we go flying, let's check the Central Missouri weather radar. 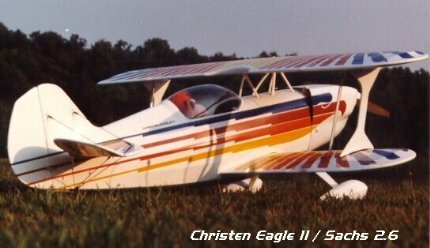 Built and test flown in 1988.
that my Christen Eagle had with a Goldberg Eagle 63. This is my first attempt at creating a web page! Looking for more R/C Stuff? is owned by Dave McDonald.